The Brighton Township Municipal Authority (BTMA) provides potable water service to over 2,700 customers. The customer owns the water service line between the home and the curb box, which is usually located near the waterline adjacent to the road in front of the home. Municipal Authority regulations require the customer to be responsible to maintain, repair and, if necessary, replace the water service line from the home to the curb box. Water use is metered for each customer. Most BTMA customers are residential and have the meter located within the home. If the customer does not have a basement, or is a long distance from a public road, the water meter may be located within a meter pit, which is generally adjacent to the public road. BTMA has three billing districts and reads the meters in each district on a rotating quarterly basis. These meter readings are used to bill for water service along with sewage service if the property has sanitary sewer service from the Brighton Township Sewer Authority (BTSA). More information on water and sewage billing is available elsewhere in this newsletter or on the Brighton Township website within the Residents Center on the Water Sewage Authorities page. There are many ways to be water wise in and around the home. Following these simple tips can help save money, in addition to helping to conserve water and energy. Use the water meter to determine if you have a leak. Start by making sure that no water is being used in the home. 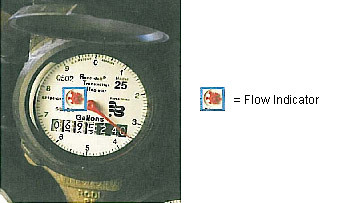 Check the flow indicator on the dial of the meter. If the flow indicator is moving, and no one is using water, you could have a leak and need to perform other checks. Drop a leak detection strip/food coloring into the tank. Wait 10-20 minutes. If the coloring appears in the bowl, your bowl has a silent leak and repairs need to be made. If you hear water running, it may mean that water is running over the overflow tube in the tank. This too should be fixed. Faucet Leaks, Sink, Tubs, Showers, Hose Bibs – If your faucet drips or it continues to run after you shut it off it needs fixed. Also check hose bibs and faucets in the garage and unheated areas of your home during winter months. Hot Water Tank – The pressure relief valve is usually near the top of the tank and the drain valve is near the bottom. Automatic Ice Makers – A leak will cause excessive ice accumulation in the freezer and may also produce small puddles of water under the refrigerator. Washing Machine and Dish Washer – If you see water on the floor the washing machine or dish washer may be leaking. Over time the hoses from the faucets to the washing machine or dish washer will deteriorate and may start to leak. Water Softeners – The cycling process is regulated by a timer, and often occurs between 2:00 and 4:00 A.M. You are likely to have a problem in this unit if you constantly hear the sound of running water. Humidifiers – Water accumulating beneath unit could be a sign of a leak. If the overflow unit discharge is piped into a sewer or drainage line, you may not find any visual signs of a leak. If it is a continuous leak the float may be stuck and could be making a constant sound of water running. Faucets and Hose Bibs – Each outside faucet should be checked for leaks. During the winter months inside shut off valves should be closed to prevent the outside faucets from leaking. Swimming Pools – If the water level stays higher than normal, or the pool overflows when the pool is being used, the automatic shut off valve may need to be checked. Customer Owned Water Service Lines and Lawn Sprinklers – Soft spots in your lawn may indicate a break in the underground piping that could be leaking and being absorbed into the ground.